If confirmed, Elena Kagan would become third woman on nine-member bench and the fourth woman in court's history. Washington (CNN) -- The Senate Judiciary Committee will begin its confirmation hearings for Supreme Court nominee Elena Kagan on June 28, Sen. Patrick Leahy, D-Vermont, announced Wednesday. "There is no reason to unduly delay consideration of this nomination," said Leahy, the committee's chairman. He asserted that the start date is "a reasonable schedule that is in line with past practice." Last year, he noted, "we proceeded with the hearing on the nomination of Justice (Sonia) Sotomayor 48 days after she was designated. Senate Republicans said that hearing was fair, and was conducted fairly. This year, I am scheduling the hearing to start 49 days after the nomination was announced." President Barack Obama nominated Kagan on May 10 to fill the seat being vacated by Justice John Paul Stevens, who announced his retirement last month after 34 years on the high court. 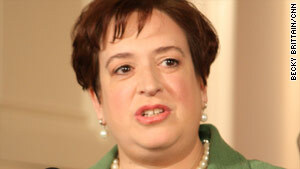 Kagan currently serves as the Justice Department's solicitor general. Alabama Sen. Jeff Sessions, the committee's top Republican, noted that he had asked Leahy to delay the start of the hearings until after the congressional July Fourth recess. "This would give the committee adequate time to review Ms. Kagan's record and to prepare for the hearings -- including a careful review of the hundreds of thousands of pages of documents we expect to receive," he said. Sessions warned that "it remains to be seen" whether Leahy's schedule "will be adequate to allow us to meet our important constitutional responsibility to thoroughly review Ms. Kagan's record ... and to hold respectful and substantive hearings." Sessions said he has told Leahy that "developments may occur during the course of such a review that simply require additional time." Senators are currently reviewing Kagan's several-hundred-page response to the Judiciary Committee's bipartisan questionnaire, a document used to explore every high court nominee's academic, legal, and financial record, among other things. Nine boxes of material were submitted to the committee Tuesday afternoon, and posted online shortly thereafter. Leahy's announcement came as Kagan continued a series of meetings with individual senators on Capitol Hill -- part of the process of laying the groundwork for the confirmation hearings. Kagan met Wednesday with seven Democrats: Wisconsin's Russ Feingold, Delaware's Ted Kaufman, New Hampshire's Jeanne Shaheen, Nebraska's Ben Nelson, North Dakota's Kent Conrad, Missouri's Claire McCaskill, and Hawaii's Daniel Akaka. Democrats have generally offered strong praise for the 50-year-old nominee, claiming she would be a fair, independent member of the high court and a worthy replacement for Stevens. Republicans have questioned Kagan's lack of experience on the federal bench and whether she would act independently of Obama's agenda. They've also criticized Kagan for her efforts to block military recruiters from Harvard University during her time there as law school dean because of the military's "don't ask, don't tell" policy. The policy, opposed by Obama, prevents gays and lesbians from serving openly in the armed forces. If confirmed, Kagan would become the third woman on the current nine-member bench and the fourth woman in the court's history.